The best speaker you can buy under $8000. These speakers needed another review, and since I've owned them for 10 months, I think I can say without question that they will be with me for the long term. I upgraded from a wonderful stand-mounted speaker (NOLA Boxers) because I needed to hear more of the music from a floorstander. I came across these used at a terrific price, and could not pass them up. Mine are maple, and the cabinetry is beautiful, as is to be expected. A nice feature is the retractable spikes-use an allen wrench to raise or lower them from the top of the base plate. This way, you don't have to tip back the speakers to level them on carpet. The thick metal baffle, along with a very stiff cabinet, prevents unwanted resonances. The bottom-mounted tweeter is unique, and really pulls the music together. There is no getting used to this arrangement, it just works. My room is 18'x14', and I am using a Marantz Pearl integrated amp (140 wpc@4 Ohms), and the sound is amazing. Plenty of bottom end (specs are down to 35 hz), room filling and then some. Others have said more power is better with Dynaudio, but I'm perfectly happy with 140 (actually 160 measured) clean watts. Bottom line, give these a listen if you get the chance. Garb them if you see a good deal, and you won't look back. Everything that everybody has said about this speaker is true. If you want to hear the music and emotions of the performer, this delivers. I had to add another review for this speaker as there is certainly a lack of them on the net. The typical review has to be clinical for good reason. And through this pile of net speaker reviews, I needed to make a call on wether to buy a 2nd hand high end speaker, previously unknown to me. I made the call based on the first two reviews here and one other review on another site. The reviewer referred to his wife's emotions as ' tears welled-up in her eyes'. Would you start a review that way ? For fifteen years I happily ran a Denon 1500MKII CD palyer, CyrusII+PSX and Monitor Audios 352. When these packed in, my liimited budget made me move into the inexpensive Chinese stuff. I bought a Shanling CD10T Auditronics Specila Edition Vacuum Tube CD player cost Aus$770, a Classic 9.0 Vacuum tube preamp and 8.0 power amp cost Aus$1300. The amp delivers 150W into 8ohms and 240W into 4 ohms. Both came from Hong Kong. With the Monitor Audio 352s I was not a happy puppy. I missed my Cyrus, or so I tought. One last throw of the dice,'I needed new speakers, do I go for a 2nd hand reputed high end or go for Chinese cheapie 'Audiophile' speaker ? Oppurtunity knocks but once. As rare as hens teeth, a 2nd hand s3.4 is available, After some negotiating, its now in my living room. I had tears when I heard Karen Carpenter. My wife had the same reaction with Aretha Franklin. Expensive. Need plenty of power to sound their best. Cosmetically, an industrial look. I read the review by Simple - a shorter version of the one he wrote for Audioasylum - with considerable interest having auditioned these speakers some months earlier. This prompted a second listen and ultimately a purchase. Having had Proac speakers before with rear firing ports (2) that produce a retreating soundstage it was interesting to note that the soundstage was further forward with the Dynaudio with only one rear firing port. But the left to right imaging is superb. The industrial look front baffle make this speaker less attractive to wives if the pseakers are run without the magnetically held plinths in place but quick replacement is a simple matter if the need arises. Before buying these speakers I had acquired a Wadia CD player which aims to produce an "analogue" sound. In my previous set up on many recordings the sound became very warm and "gluggy". There is no sign of this now. The Dynaudio 3.4s are not cheap and in this part of the world the choice is not endless for competing products. 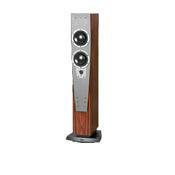 But they are probably 20% dearer than say the equivalent B&W or Sonus Faber. On the other hand they occupie less floor area and in small rooms that might be important. well i cant believe this is only the second review,for such a outstanding speaker. I guess thats because people who own them are to busy listing to music,and that is exactly what youll want to do when you hook these up. The soundstage is always well developed and reachable. There is an ambience of space which is larger and more enveloping as compared to the Dynaudio Special 25s. The rhythm and boogie-factor is felt in spades. They are well balanced, and very smooth, portraying all the beautiful timbre's and musical textures more times than not -- without dancing the fine line of over extending it’s resolution capabilities. To convey the intrinsic magic many of us search for in a loudspeaker, and given it's asking price and performance - I dare say that with the Dynaudio S3.4 we have " a new Classic". Bravo Dynaudio, and thank you ! The S3.4's arrived double-boxed a few weeks back and had a fairly easy and un-eventful break-in period as I played them continually with 2-channel audio and 2-channel dvd films at various volumes. Compared to the Special25's (more on the S25 later) which took well over 2-monthes to fully break-in; the S3.4's were quick to open up and relax. Cosmetically the S3.4's are a simple and refined Danish design with subtle cues from the more expensive Confidence and Evidence lines. The black base plinth's are a wonderful touch and anchor the S3.4 to the floor and incorporate a spike-level-adjustable feature from the top, i.e. you don't have to turn the S3.4 on it's side or upside down to adjust the spikes. The grill-cloth's are situated on the drivers metal face plates via hidden magnets, and can be taken on and off with a slow and steady pull; these are not flimsy connections at all and the magnetic tightness is surprising; no plastic nubs to break-off. The grills hug the corners in a tear-drop fashion and perfectly align with the outside perimeter of the drivers. From the profile view, you are able to see through the grill spacing and the profile of the drivers edges as well as the round side of the tweeter. All of it is tightly nestled behind the grills; giving it a 'multi layered sandwich effect'. The (2) 6.5" newly designed drivers reside vertically above the newly designed 1" soft-dome tweeter. The fit and finish are flawless; as one should expect in any loudspeaker priced at $5,000. Standard WBT clear binding posts (no bi-wire; i.e. clean and simple) are found at the bottom rear. The S3.4 are not imposing nor bulky, and will not physically overwhelm a smaller/medium sized room; as their footprint is very small and reasonable. Sliding them on carpet is a breeze. For comparison purposes: the front dimension of the S3.4's are narrower and slightly taller than the S25's (if you have the S25's on 24" stands), and the depth is very similar. Overall, the look and stance of the S3.4 is not predominantly "rectangular" as you'd expect, instead you will find your eyes following the hour-glass curves of the face-plate/grill clothes tear-drop shape directly flowing down towards the complementary curves of the base-plates. You should know that imaging is one of the quality's that we are very fond of when auditioning speakers and eventually a big factor when selecting them for our home. Typically we are not huge fans of big floor-standing loudspeakers because they don't always typically image as well as smaller 2-way (physically smaller box) monitor(s). Well, the S3.4's do image equally as well as our S25's and prior 1.3SE's. In many ways the S3.4's bettered the smaller box models with respect to the height, size, and depth of the image. Not only does the 46" tall S3.4 disappear -- it does so, easily. We have owned most B&W Matrix models, a few B&W Nautilus models, and the WilsonAudio Witts. Many of them a fine speaker; however in most cases the imaging and overall picture/image of the music would suffer. The S3.4's have a very ‘tangible’ and un-processed quality, and they are not like any prior speaker we've owned or auditioned. The S3.4's possess a new and exceptional 'voicing' as compared to all older models of Dyn's. The only way that I can articulate what my ears hear is to say that the timbre and resonance character has been made more organic and integrated. Part of what constitutes the organic flavor is the smoothness between drivers and overall tonal balance (not lean; not heavy; not light; not dark) as well as the drivers themselves; also the inverted driver array. The voicing of the S3.4's is one of it's greatest strengths and should appeal to many who audition them. There is a real sense of flow that you will immediately notice upon your first audition. One criteria that we both dislike when auditioning any loudspeaker is: the amount of manufactured bass "bloom" in the lower bass regions. Many other loudspeaker makers seem quick and proud to cloud the lower regions with something other than musical instrument reproduction; we refer to it as "made-up bass noise". While listening to the S3.4's we did not hear any discernable made-up bass or artificial bloom - Period. What we did experience was fluent and expressive bass notes from real instruments. In comparison to the the S25's and 1.3SE's: both of those models are not able to match the frequency response of the S3.4's. The S3.4's have remarkable bass response; I cannot quote you a frequency range as of this writing; but it puts a smile on our face everytime the S3.4 starts digging deep - and it does so without adding any artificial ingredients, and it does so easily. Summary: The Dynaudio S3.4's Contours in contrast, embody a new and Natural voicing that convincingly sounds right on most source material. The S3.4's present a strong organic character when portraying instruments and vocals; without the additives.